Early morning we will take the two hour ride through Mago national Park to reach a Mursi village. As they are nomadic it is impossible to name the settlement we will visit. The women wear circular clay lip plates, the men are garbed in large towel like wraps. Photographing women grinding sorghum and breast feeding while making their morning coffee which they drink out of gourds is possible. Our local guides handle the photo fee payments so you can shoot with abandon. For protein the men bleed a bull in the early morning and drink its blood. The homes are thatched straw and sticks ,and these people are illiterate and their traditions are very much intact.many of the men have body adornments. A sense of humor is needed to fully appreciate the Mursi photographic experience. The afternoon will be spent wanderingthe dirt street and markets of Jinka. The market is colorful and vibrant with many bars, stores selling plastic woven baskets, and day to day items. Splitting into small groups a guide will help you with translation, setting up shots if desired and see to it that you can photograph freely. The group will visit Omo Child Center www.omochild.org in the afternoon. The director, Lale Labuko who is the only western educated Kara tribe member and a National Geographic Emerging Explorer will give us a tour and we will have a question and answer period. The kids can be photographed and visiting Omo Child is always an emotional experience. Lodging nce again will be at the Eco Omo Lodge which has a patio where the group can have cold beer or hot coffee after this long day. This being Monday we will attend the Turmi market. The Hamer people will be selling honey, snuff, foodstuffs and local wares. The group will be be split up and wander freely shooting the many stalls. Of note the stores have some artistic designs and the crafts market is the best in the Omo. The grain mills are amazing and many stores are great backdrops for street photography. Departing Turmi at 5:00 AM, our photography group will head to Dus,the friendliest villages of the Kara tribe. Settled on the banks of the Omo River, this tribe is known for their creative and decorative body chalk painting. 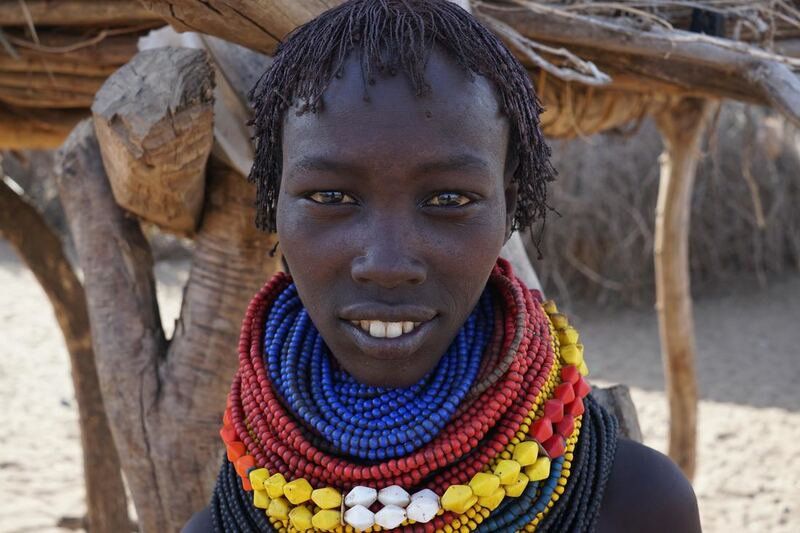 Many of he Kara women have pierced lips and insert nails and pins. Photographing on the bank of the Omo River can yield images of the kids diving into the water The group will shoot a cattle and goat drive which is iconic. Dust swirling, men with guns and long herders stick driving their herd to the water. The group will photograph the ceremonial, communal dance performed by the people of Dus. .Epic Photo Tours will be donating bags of grain and the dance is how they say thank you. We have a special relationship and they will invite us intot heir huts for coffee to be had out if a gourd. The Kara of Dus pride themselves as the best dancers in the Omo. We will also photograph these warm and inviting people on the banks of the Omo and in the shade, under the large umbrella like trees. We will be bringing a picnic breakfast and lunch with us. ON Buska Lodge in Turmi. Today we will fly back to Addis Ababa from the Jinka airport. The group will return to Addis early in the afternoon and go to a Fair Trade home goods store that has the highest quality fabrics/ shawls/ linen.. Those leaving on late night flights will be driven to the airport. Farewell dinner will be in the hotel. Transportation to the airport provided.